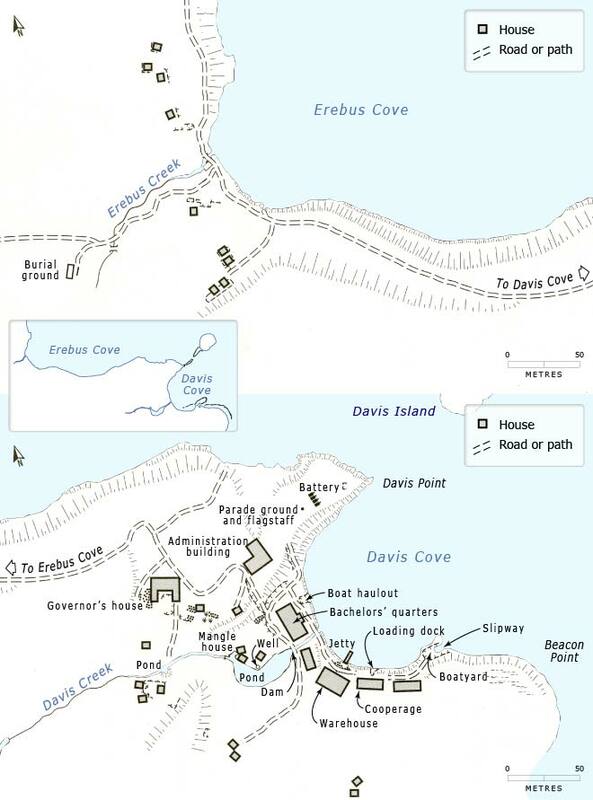 Based on archaeological investigations and historical records, these maps give some idea of the extent of building at Hardwicke, the township for the Enderby settlement at Port Ross on Auckland Island. In addition to some 20 houses for married families, there was a substantial house for the governor and a number of community buildings such as a warehouse and a cooperage for building barrels. Source: Paul R. Dingwall and Kevin L. Jones, 'The Enderby settlement (1849–52)'. In Paul R. Dingwall, Kevin L. Jones and Rachel Egerton, eds., In care of the Southern Ocean: an archaeological and historical survey of the Auckland Islands. Auckland: New Zealand Archaeological Association, 2009, pp. 59–86, fig. 4.9.